This entry was posted in Community, Events and tagged auburn, Harrison School of Pharmacy, university on October 7, 2011 by Wire Eagle. AUBURN – Starting next week, student pharmacists from Auburn University’s Harrison School of Pharmacy will hold a series of community outreach activities locally and in Mobile to raise awareness about the health consequences of poor medication adherence, or not taking medication as directed. All events are free and open to the public. Auburn University student pharmacists in Mobile and on the main campus are joining with students across the country in conducting activities throughout October, as part of a national effort to educate consumers on the importance of medication adherence. 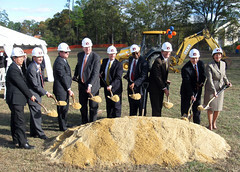 This entry was posted in Events, Faculty and tagged auburn, awards, Faculty, university on October 4, 2011 by Wire Eagle. AUBURN – Auburn University recently held its sixth annual Faculty Awards Celebrating Excellence Ceremony at The Hotel at Auburn University and Dixon Conference Center. The awards presented at the ceremony are the highest honors the university gives to faculty and this year honored the outstanding academic achievements of 20 faculty members. (Photos and videos of the event can be found here). Auburn University Interim Provost and Vice President for Academic Affairs Timothy Boosinger hosted the event and Bob Howell, WSFA-12 evening anchor, was master of ceremonies. Dale Coleman, associate professor of Animal Sciences in the College of Agriculture, gave the invocation. Sarah Newton, Auburn University Board of Trustees member, gave congratulations and special remarks. This entry was posted in Academic achievements, Research and tagged auburn, grant, nsf, university on September 28, 2011 by Wire Eagle. AUBURN – The National Science Foundation has awarded Auburn University a $3 million, five-year grant to instruct doctoral students in the sustainable production of biofuels and chemicals. The grant, an Integrative Graduate Education and Research Traineeship, or IGERT, is the first awarded at Auburn. The collaborative project, “IGERT: Integrated Biorefining for Sustainable Production of Fuels and Chemicals,” is led by Mario Eden, an associate professor of chemical engineering at Auburn. This entry was posted in Community, General News and tagged auburn, outreach, university on August 24, 2011 by Wire Eagle. AUBURN – Auburn University’s Office of University Outreach will kick off the new school year with an event to launch the 2011 College Prep Initiative, celebrating the partnership between Auburn University and Loachapoka schools, on Monday, Aug. 29, at 5:30 p.m. at Loachapoka High School. There will be an opening reception followed by welcome remarks at 6 p.m. The event will provide an opportunity for students and families in the community to learn about and sign up for numerous educational programs offered by Auburn University. The College Prep Initiative is in its second year and was established to engage students and inspire them to attain postsecondary education. The goal of the initiative is to have a majority of the graduating class accepted into a college or university.